I don’t know what it is about Denali that makes the pull so strong, but out of the Seven Summits, this is the one that gets my heart racing and me longing to get out onto the mountains again. It might not be the highest of the Seven Summits but it is certainly one of the challenging ones. Dropped off in a propeller plane in the middle of a glacier, the plane doesn’t bother switching off its engines. They merely drop you off and head out into the sky again, leaving you and your team standing alone, desolate in the Alaskan Mountain Range. Because of the arctic conditions you are hiking in, the weather is extreme and severe and as the plane fades away into the blue sky, it’s just your team, you and your heavy backpack and the sled you will be pulling behind you as you make your way towards the summit. A year ago, after climbing Aconcagua, I was already dreaming of this mountain. It’s not my next mountain to climb but it is on my list of seven that I’m climbing for a cure for Cystic Fibrosis. Like most other high altitude mountains to climb, it is an expensive extreme sport and as always I have to factor in leave from work. But I have no limits to the dreams I have. All that matters is that it is my dream and without any doubt in my mind, I know one day, whether it is in two years’ time or ten years’ time, I will climb her slopes. That’s the amazing thing about dreams. You can dream as big and expansive as you want and by believing in your dreams, that is how they become possible. A year ago, I already started researching to find the perfect training I could do to prepare myself for a mountain like this. Training that will strengthen my body, not only to carry 20 kg’s on my back as I climb at altitude, but to pull a 40 kg sled behind me at the same time. Since my climbing expedition began, I have become the fittest I have ever been in my life and this mountain will be no different, my fitness level will probably be at its highest by the time I head out to her slopes. I am not delusional in any way, it will be hard and probably one of the toughest mountains I have yet to climb but the dream of one day waking up to the news that a cure has been found for Cystic Fibrosis spurs me on. When the air near the top gets thin and the slopes get steep and my breathing becomes laboured, I am reminded of what each and every person with Cystic Fibrosis will at some time of their encounter; shortness of breath and difficulty just doing the simplest of things like getting dressed in the morning or even just getting up. 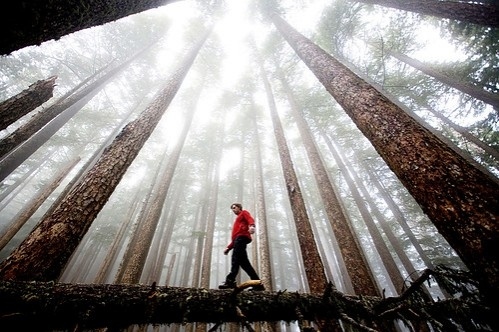 The higher I climb at altitude the harder it gets to breathe and to do even the simplest of tasks. This has always been my mission: To climb for a cure. I have climbed two of the Seven Summits already. One will be a redo as we had to turn back 400 metres shy of the summit due to the high risk of avalanches due to the severe weather that had hit us on summit night/morning. This is life on the mountain, there are no guarantees. Mountain climbing has always been a love for me and now climbing at altitude has become a passion. This morning as I woke long before my alarm sounded, I lay in bed reading Will Cockrell’s account of his journey to summit Denali. Reading the words of his experience, my heart raced a little faster as I read faster, taking in his experience. 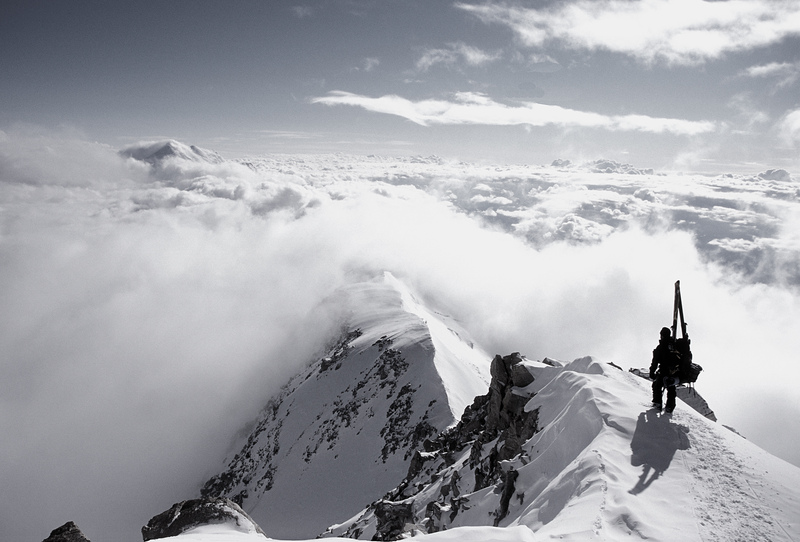 When I read of others experiences on the mountain, I am transported back to mountains slopes I have walked myself. It’s hard to explain completely what happens on a mountain to those who haven’t been before, it’s a shared experience with those who have had the privilege of being out there too. Words can hardly ever describe the extreme mental and physical things you endure while out on the mountain and yet the pure ecstasy of what you are doing makes it worth every single step. Denali, also known as Mt McKinley, is North America’s highest mountain. 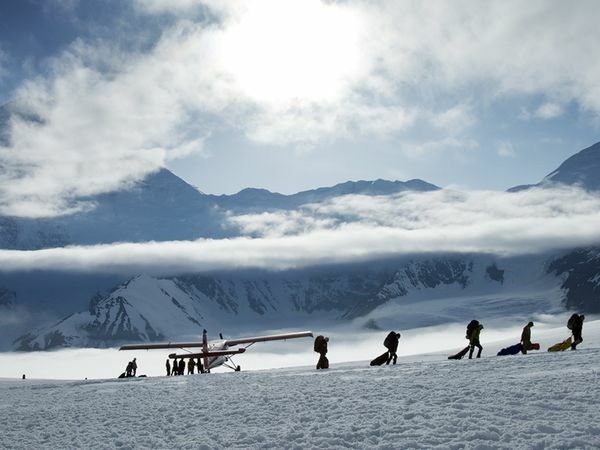 The Denali climb begins deep in the heart of the Alaska Mountain Range on the Kahiltna Glacier. 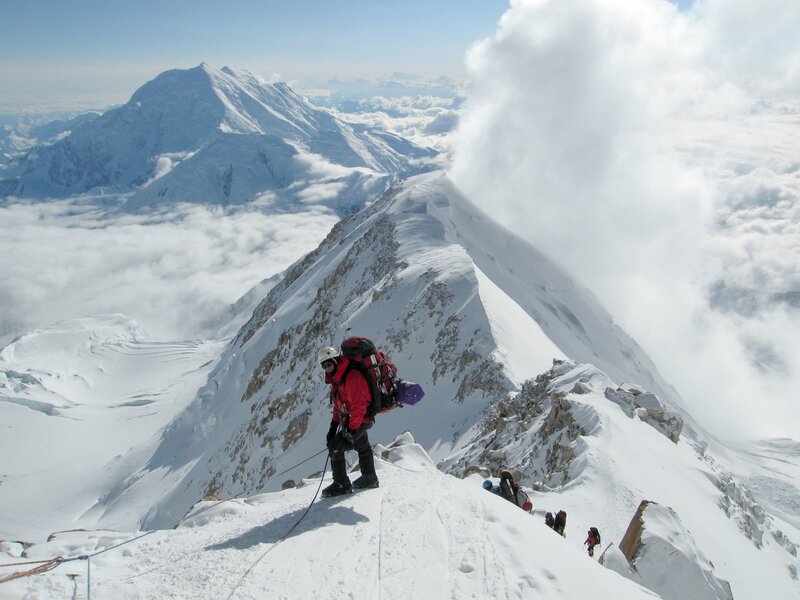 The climb takes approximately 17-18 days round trip from Base and usually additional days (about four) are added to allow for inclement weather, acclimatization and optimal summit attempts. Located just two degrees south of the Arctic Circle, Denali’s environment is an eternal winter. It is a mountain of extreme conditions where a climber may encounter 100-mph (160km) winds and temperatures can range anywhere from-30F to -70F (-36 to -56˚C). Alternately, some days on the lower slopes are quite hot with sunshine lasting up to 20 hours. The best snow and weather conditions for climbing in the Alaskan Range are usually best from May through July. Colder minimum temperatures and strong northwest winds commonly occur in May. Late June and July are warmer but more unsettled. By late July, travel on the lower glaciers is made difficult by melting snow bridges over crevasses and by more inclement weather with heavier snowfall and increased avalanche danger. The highest success rates occur in June. April is an excellent month for many of the lower peaks with conditions often cold and clear while the winter extremes still linger on Denali. The coldest weather on Denali is found from November through April with average temperatures ranging from -30F to -70F (-36 to -56˚C). It is not uncommon to find it -50F (-56˚C) at the 17,200 foot camp in early May. Something to keep in mind when choosing the month to climb, going really late in the season will probably mean that you won’t be able to get picked up again as the planes won’t be able to land on the exposed glaciers; this means a 10 day walk through the forest! *Grin* Well I do like a challenge! To add more of a challenge while climbing Denali, there are no porters available to cut some slack for us climbers. All expedition members carry their own gear and a month’s worth of food, usually around 300lbs (136kg’s) between a climber and his/her partner. The gear is split up between your backpack and a sled is pulled behind you. While climbing Denali, the low camps are by far the warmest parts of the mountain. Deep snow and climbing gentle slopes, but with lots of distance to cover can be expected. No doubt the sled pulling combined with heavy backpacks will help balance the challenge while on this expedition! Reaching Advanced Base Camp is similar to travel through the low camps. Heavy backpacks combined with the use of sleds is still the method of travel. Although the distance between the camps is shorter, the terrain becomes much steeper. Advanced Base Camp is where climbers will spend the majority of their time, hoping they get that window of opportunity to move on the high camp and later summit. Due to the troposphere being thinner around the arctic, the barometric pressure on the mountain is significantly low, making it “feel like” you are at a higher altitude. This is said to be a major reason why an unusual amount of climbers succumb to altitude problems. With spectacular views and intense weather, high camp is said to be beautiful but brutal. Reaching high camp is apparently the most technical part of climbing Denali. The ascent begins with fixed ropes up 50 degrees of ice right outside Advanced Base Camp. Then the wait begins for the perfect weather break to head out to the summit. 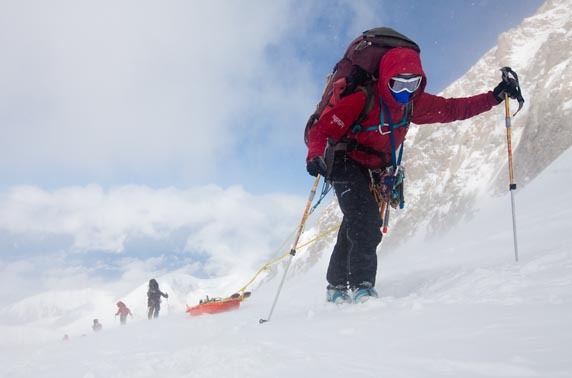 Reaching Denali’s summit includes several technical challenges and difficult terrain and it is likely to be the coldest and riskiest day of the entire climb. But I can only imagine, after weeks of excitement and boredom, hard work and anxiety, the final push to the summit is what makes it all worthwhile. For me, on summit day, my body finds new strength with my goal and dream at the forefront of my mind. I become more focused that I have ever been. While it may be true that the Alaska Range has a reputation for poor weather and brutal storms, I know from past experience, when the weather is good, the rewards of being there are immeasurable and on a mountain like Denali I can already imagine that the expansive glaciers and the rugged summits will be forever impressed in my memory. In 2015 I will begin training for my third of the Seven mountain summit I hope to climb, which will be in Russia. I’m excited at what lies ahead. 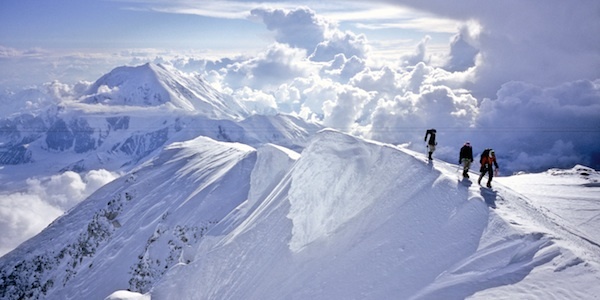 I’m excited at the thought that Denali lies beyond my Russian climb. The call is the strongest one yet and as I journey every day closer to my dreams, my heart continues to beat a little faster as I rub my hands in glee at all that lies ahead. Call me crazy but I dream of sitting in the vestibule of my tent, breathing hard as I try to take in as much air into my lungs as humanly possible. I long to struggle with ice-cold fingers to snap on my crampons over my big and bulky snow boots, something that is impossible to do with thick gloves on, hence the ice-cold fingers. It may not be everyone’s idea of a cool way to spend a holiday, but this is my dream. I long to glance out at the mountain ranges before me as the snow crunches beneath my boots and to breathe in the crisp, ice-cold air. I long for the struggle, the agony and ultimately the ecstasy of realising another dream and once again to be a part of the elite few that get to experience the true magic of life on the mountain. The mountains will always call, and I will always go. I am a simple girl with BIG dreams.